SPONGES: They are Nothing Like Sponge Bob! Although they may look plant-like, sponges are the simplest of multi-cellular animals. A sponge is a bottom-dwelling creature which attaches itself to something solid in a place where it can, hopefully, receive enough food to grow. The scientific term for sponges is Porifera which literally means "pore-bearing." A sponge is covered with tiny pores, called ostia, which lead internally to a system of canals and eventually out to one or more larger holes, called oscula. Within the canals of the sponge, chambers are lined with specialized cells called choanocytes, or collar cells. The collar cells have a sticky, funnel shaped collar and a hairlike whip, called a flagellum. The collar cells serve two purposes. First, they beat their flagella back and forth to force water through the sponge. The water brings in nutrients and oxygen, while it carries out waste and carbon dioxide. Second, the sticky collars of the collar cells pick up tiny bits of food brought in with the water. Another type of cell, called an amebocyte, takes the food to other cells within the sponge. Sponges are very effective filter feeders, since they are able to capture and eat particles as small as bacteria as well as much larger particles. The "skeleton" of the sponge is composed of tiny needle-like splinters called spicules, a mesh of protein called spongin, or a combination of both. Many sponges can only be identified by microscopic examination of the skeleton, which makes certain identification from photographs difficult. Most sponges are hermaphroditic (having both sexes in one), but produce only one type of gamete per spawn. (i.e. some play the male role and the other plays the female role, even though they are both capable of playing either role). The sperm is released into the water column by the "male" sponge and finds its way to the "female" sponges, where fertilization occurs internally. Eventually, the planktonic larvae are released from the female sponge and float around in the water column as plankton for only a few days. They then settle down and start growing. The next time the sponges reproduce, they may change sexual roles. There are many different types of sponges in the world's oceans, and, contrary to popular belief, they can be quite colorful and beautiful. Sponges come in two basic types: encrusting or free-standing. Although neither of these names are part of the true classification of sponges, it does make it a bit easier to organize them. Encrusting sponges typically cover the surface of a rock in the same manner that moss covers a rock on land. Free-standing sponges are a bit more interesting. 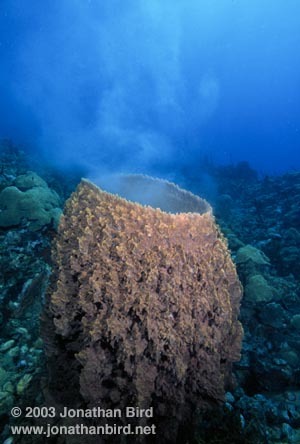 These sponges have more inner volume compared with their outside surface area and sometimes grow into strange shapes, often reaching gigantic proportions.Many of the free-standing sponges are well known to most people. For example, nearly everyone has heard of the barrel sponge, a large tropical sponge which sometimes grows large enough to fit a whole person inside. Equally well known are the tube sponges of the tropics, coming in nearly every color of the rainbow.While not all sponges are as colorful or as large as those found in the tropics, sponges are an ancient and efficient design which will probably continue to populate the world's oceans longer than people will populate the Earth. Check out some more sponge pictures here. In this photograph, the pumping action of a sponge is illustrated. 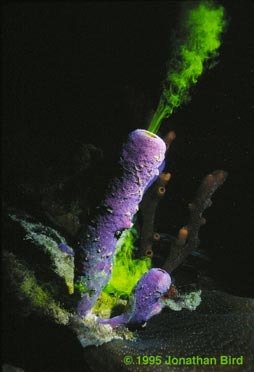 A non-toxic yellow dye has been squirted around the base of a purple tube sponge in the Caribbean. Shortly thereafter, the dye is pumped out through the osculum at the top of the sponge. Some sponges grow quite large. 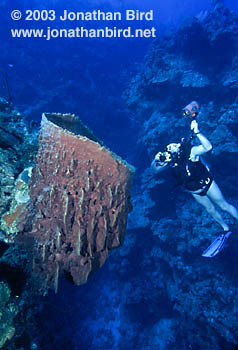 This barrel sponge is nearly large enough for the diver to climb right inside! Other barrel sponges get even bigger than this. This barrel sponge is spawning.